This simple vegetarian recipe features a healthier version of Hollandaise. 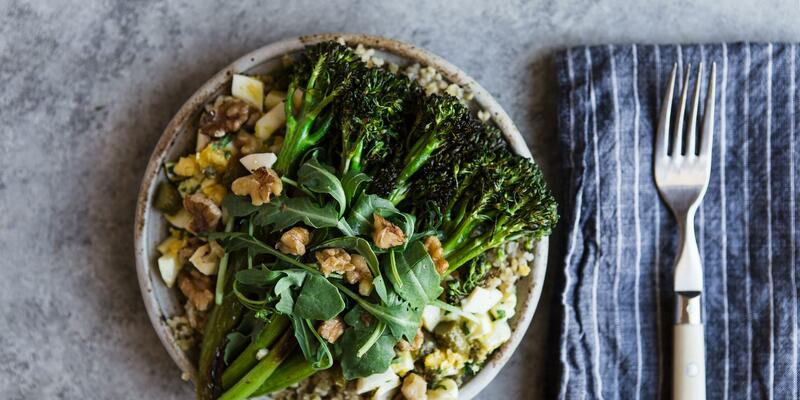 "Broccolini, the longer-stemmed and more tender broccoli, is sweeter than its friend broccoli rabe, which is a bitter green," explains Katzie Guy-Hamilton, chef and director of food and beverage at Equinox. "Here, it's topped with a protein-packed condiment called gribiche." Toss broccolini with rosemary oil and a pinch of sea salt and pepper. Place on a tray and roast at 450 degrees for 15 minutes, then remove and allow to cool. Place in salad container over the freekeh and top with gribiche. Add ½ cup of arugula and store in the fridge. Season with a squeeze of lemon if you desire and walnuts from your condiment kit. You can gently warm this dish on low in the microwave for 40 seconds.